I’m sure you have heard a lot of people tell you that you should be eating better and exercising more, but they don’t tell you how to actually do it and succeed. It’s this vague thing that your doctor tells you when you go there because you’re sick and they take your weight. Or you see people posting their progress stories of how they have changed their eating habits and exercise routines this month by following a new program. There are so many programs out there that tell you to follow only their certain options without taking into consideration what YOU and YOUR family likes. That is why these are short term programs and ultimately why they don’t work long term for a lot of people, specifically families. Did you know that 2/3 of all diseases are from lifestyle choices? The ROOT cause – POOR EATING HABITS. “Approximately 80% of chronic disease and premature death could be prevented by not smoking, being physically active, and adhering to a healthful dietary pattern,” by David Katz. Imagine if you actually changed your entire lifestyle to include: eating more fruit and vegetables, more lean meats, and whole grains. Imagine if you start getting more physical activity in, even if it’s 30 minutes a day at a time where you can actually manage it. This can mean going ride a bike around the neighborhood, walking on a treadmill, and playing sports with your kids too! So how do you change things and make this part of your lifestyle? This is where lifestyle medicine comes in. It’s about making changes that fit in with your lifestyle but making healthier decisions. This means adding in more fruit and vegetables, more lean meats that are cooked another way except for fried, eating more whole grains, and adding in some physical activity. It also includes your mental health and physical health too. It’s a broad term, but I want to focus this article on one aspects of it: healthy eating. When you choose to make healthier eating decisions, this is where you have to think about things that you and your family like to eat. Do you really have the time to meal prep your lunch and dinner while cooking your family something different because you were given a meal plan from the internet that doesn’t have items that your family would eat? Or would you rather eat food that makes both you and your family happy while eating healthier items? Before you start changing your lifestyle, write down food that you and your family likes. Start with this list and find recipes that you would enjoy trying. If you see a lot of fat or unhealthy items, that’s when you start trying to add in more vegetables. For example: Your family likes having pizza every Friday night. Eat 1 or 2 small slices, but have a side salad with it and add vegetables to the pizza as well. You’ve just made a better decision than eating 4-5 pieces of pepperoni pizza alone. Another example: You don’t have time to cook breakfast so you usually skip it. Grab a banana and have boiled eggs in your fridge to grab and go. This is better than skipping breakfast all together. I know those examples may not work for every person – but that is the point. Every person and every family is different – which means you need different things. If you know that you are a busy family with school, sports, and other things that doesn’t give you the time to prepare meals from scratch every night, then you would likely benefit from frozen vegetables that you throw in the microwave and they steam in the bag. You could also use frozen. cooked meats to create a dish fairly quick! This helps you to cook things faster, but still gives you some great nutrients at the same time. A note about frozen items, I’m sure that you’ve heard that they are really high in sodium, but companies have been hearing this complaints and are making items lower in sodium. This is where knowing how to look at a nutrition label comes in handy. 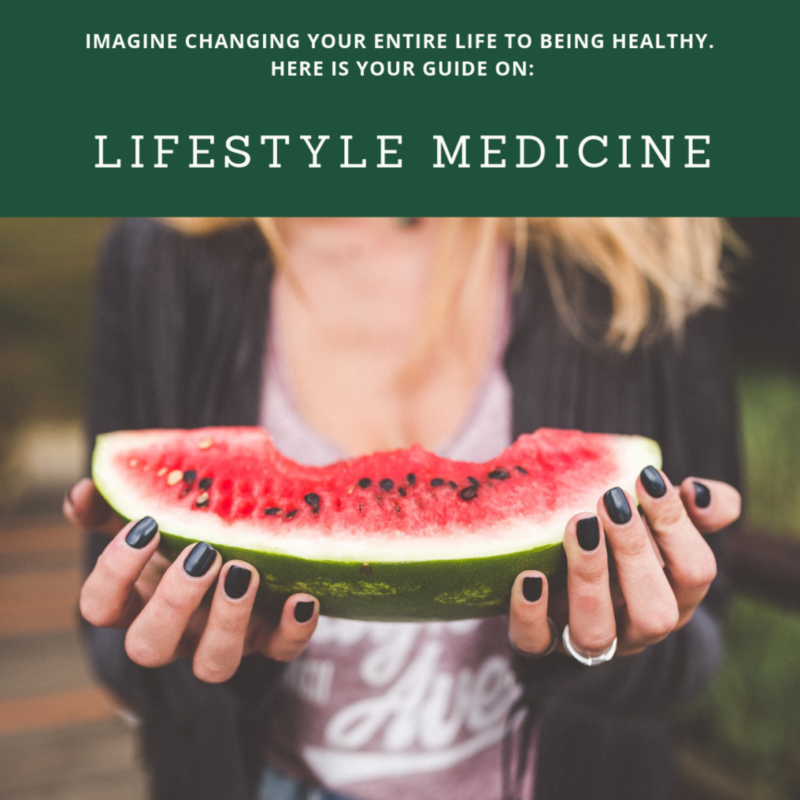 This is just a snippet of what lifestyle medicine is all about. It’s about taking your needs and creating a way for you to live a healthier life by changing small things. You shouldn’t have to follow something that you and your family doesn’t enjoy eating, but it should be nutritious and healthy for you! Questions? Post your questions below and I’ll try to answer them!